A Korean Space Launch Vehicle 1 rocket, also called Naro, launches into orbit from South Korea's Naro Space Center on Jan. 30, 2013, successfully carrying a science satellite into orbit. It marked South Korea's third KSLV-1 rocket launch, and the booster's first successful flight. The United States and the Soviet Union pushed each other to new heights during the Cold War space race, and now something similar appears to be unfolding across Asia. In the past two months, both North Korea and South Korea successfully launched satellites to orbit for the first time, and Iran claimed it sent a monkey to suborbital space and retrieved the animal unharmed. Such activities are not isolated incidents, but rather highlight a growing trend, experts say. "I think there's a significant Asian space race going on," said Joan Johnson-Freese, professor of national security affairs at the Naval War College in Newport, R.I.
North Korea's satellite launch came on Dec. 12, while rival and neighbor South Korea celebrated a similar milestone on Jan. 30. Iran announced the success of its monkey mission on Jan. 28, though some observers have voiced doubts about the claim, which has yet to be verified by Western intelligence officials. There's not much difference, after all, between a satellite-carrying rocket and a warhead-toting intercontinental ballistic missile, which reaches suborbital space on its way toward a distant destination on Earth's surface. Resolutions passed by the United Nations aim to keep such technology out of the hands of North Korea, which possesses nuclear weapons, and Iran, which is thought to be pursuing them. Asia's two most populous nations have also been flexing their space-technology muscles recently. Since late November, both China and India have conducted major missile-defense tests, which employ technology similar to that required to take out satellites, Johnson-Freese noted. "All of this technology is very symbiotic between civilian and military aspiration," she told SPACE.com. 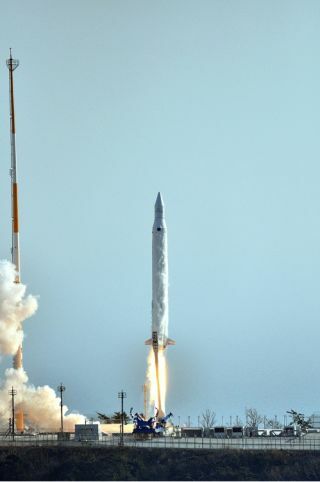 Iran claims its monkey launch will help pave the way for a human spaceflight mission, which the nation hopes to accomplish by 2020 or so. India has also voiced a desire to blast an astronaut into space. Such ambitions are in large part a response to the achievements of China, Johnson-Freese said. In 2003, China became the third country (after the United States and the Soviet Union/Russia) to launch a person into space. And last year, China pulled off a manned docking in Earth orbit, executing a demonstration mission that could lay the foundation for a crewed space station down the line. "They think they cannot allow China to be seen as that far ahead of them technologically," Johnson-Freese said of Indian officials. "And the connotation of human spaceflight is technological sophistication." China's human spaceflight successes have garnered the nation and its leaders a great deal of prestige both regionally and around the globe — a fact not lost on India and Iran, Johnson-Freese said. Such nations likely view the articulation of bold aims as important, even if success is a long shot or a long way down the road. "They know they can't catch up [to China], but they have to be seen as active players," Johnson-Freese said.